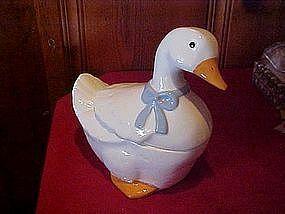 A cute ceramic white duck cookie jar marked Marcia USA. This cookie jar is made of heavy ceramic, glazed and wears a blue bow around the neck. Wonderful condition. Measures 9 1/2" tall. I have 2. Price is for each.